The Ballyboden St Enda’s club man is nominated for the award that will be announced on November 8th. HE’S ONE OF the three players in the running for the 2013 GAA-GPA ‘Footballer of the Year’ award but Dublin’s Michael Darragh MacAuley has still to cast his own vote. The 27 year-old’s stellar displays for the All-Ireland champions this year have been recognised in the form of a nomination for the award that will be announced on November 8th. “I still haven’t decided”, laughs Macauley. “I got a message from the GPA to inform me that I hadn’t voted so I better get going on that. Macauley’s nomination crowns a meteoric rise for the Ballyboden St Enda’s club man. Four years ago he was just involved on the club scene before utilising that arena to propel himself into the inter-county reckoning. “In my head, I always felt I should be here, do you know what I mean? I’ve always had that kind of positive outlook. “When I was up on the Hill, I was giving out, going ‘I should be down there’. That’s the way it is. That’s the attitude you’re going to have. “Before that, I was struggling with injury coming out of minor. I had a bad knee injury and a bad back as well, which kept me out for a while. “I struggled for two years. But I was always determined to get to where I am now. 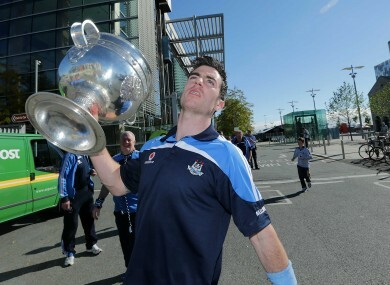 It was the club success with Ballyboden in 2009 that put myself and Darren Nelson into the frame for the Dublin team. Macauley will be in action for his club tomorrow as they face St Brigid’s in the Dublin SFC quarter-final. That and college commitments precluded him from lining out for Ireland in the International Rules this year. “It just didn’t suit. I had talks with Paul (Earley) and I have a lot of college work at the moment as well. I have a teaching placement coming up. “Between that and college and injury as well, it just wasn’t a runner. It turns out that we’re playing Brigid’s this Saturday and that would have clashed with the International Rules anyway. Email “Macauley eyes 'Footballer of the Year' award after rapid Dublin progress”. Feedback on “Macauley eyes 'Footballer of the Year' award after rapid Dublin progress”.